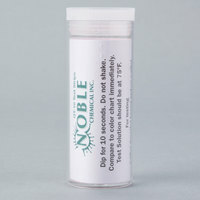 Noble Chemical QT-10 quaternary test strips are the simple, reliable, and economical way to measure the concentration of quaternary sanitizers, including n-alkyldimethylbenzyl and/or n-alkyl dimethyl ethyl benzyl ammonium chloride, and rocall II. Each strip measures concentrations between 0-400ppm (parts per million), with color matches at 0, 100, 200, 300, and 400ppm. The distinct color match at each full unit makes it easy for the user to detect exhaustion of solutions that should be replaced. It also helps avoid the use of excessive amounts of sanitizing agents, to avoid wasting product! Simply remove a strip from the vial, dip the strip into the sanitizing solution for 10 seconds, then instantly compare the resulting color with the color chart. The distinct color chart and accurate, reproducible readings give an immediate response for quick and easy use. This test strips are very accurate and easy to read. You'll need these if you're working in any kind of commercial kitchen setup. Highly recommend. These are so convenient! Having test strips on hand is a lifesaver and these are so easy to use! They are accurate as well. Great buy! Awesome test strips at a great price! Our local health inspector loves that we use these daily to make sure we're sanitizing properly. This is a no brainer - buy these and use 'em! The test strips are great compared to others i have used. The results are clear and easy to read and seem to be more accurate. Very easy to use and read, the color panel makes it easy for new employees. Use these to make sure every sanitize sink is up to code. These help me make sure that my sanitizing solution made with steramine tablets is at the right concentration. Great for taking the guesswork out of sanitizing. GREAT Product ! easy to follow instructions . You probably won't find something like this at your local stores. MUST have for your yearly food inspections. These test strips are perfect in the vial. It keeps them all from getting wet and the health department recommends using one in the vial. These test strips came up in recommended products for the sanitizer tablets we purchased. That was very useful, as I was confident I ordered the correct test strips. The health inspector was very happy, and they work great for testing our strength of sanitizer on a regular basis. Make sure that you get some of these convenient & inexpensive test strips. They are essential & you dont want to be caught without them by the health department! These strips are as easy to use as anything. Recommended purchase by our health inspector to keep on hand to ensure proper sanitation levels. Large quantity in bottle. Gets the job done in terms of passing health inspections. Make sure you purchase the right test paper for the right type of sanitizing solution. These were a GREAT buy! We are a small ice cream shop and checked with our local supplier and theirs were 5 times as expensive!! They work great, just dip and go! Love the compact bottle with the range card easily visible. Super buy! I needed test strips to test ph levels. I find these to be a good value, and they get the job done. I would recommend this product. These strips are exactly what they say they are and they do the job intended, quickly, easily, and accurately. What else could you ask? These tests were critical to passing our health department inspection today. They worked well during our test and we're grateful that they performed as intended. We purchased these at the recommendation of our health inspector; so glad we did. Use these to ensure that the sanitizer to water ratio is effective. great price on quaternary strips that we use to test with stermaine tablets and a great way to make sure that the solution meets the ppm requirement. A perfect case for a perfect product. Test your sanitizer easily with these, even has a chart on the side that shows the power. A must have for your kitchen personnel. Use these strips for my food truck. We often experience health department inspectors who want to test our sanitizing solution. These strips meet their standars. These chemical test strips are great to have on hand, simple to test your levels to make sure you're maintaining safe levels for sanitary chemicals in your rinse/sanitize sinks. These noble quat test strips are so much more affordable than getting test strips from our chemical supplier. They are compatible with our current chemical set and are about 1/3 the cost of what we paid previously. Highly recommended. Love these little test strips and I love that you get 100 in the little vial--which will last us a long time. Great deal for the price! These strips are essential in the food service industry when testing the quat water. They show that the water is the correct dilution. They are easy to read and a good price. I wasn't too sure if these Quaternary test strips were going to work because the price is just too good to be true. I am glad they do and I will continue to buy them from here. So glad we were able to purchase these on here . We were having trouble finding the right ones at our local stores for our states health department requirements. The test strips do what they are made for. Our health department approves the use of these in our sanitizing sink. The price is good also. These quat strips have saved us from the health inspector many times. We like to keep them on hand and course correct often to keep it up to par. this is a great product and easy to use. A must in our area for health department and make testing easy and accurate. we will be ordering again in the future. These strips work fine for testing quats but I'm giving 4 stars because the shipping/inventory label by webstaurant covers up the manufacturer labels and markings. Have to peel off before using and it was a pain. What a great price! In order to comply with all environmental rules and regulations you must have test strips to test the sanitizer water being used to sterilize surfaces and dishes. These are very inexpensive and even much cheaper than our local store. Great product to test within our restaurant. Health inspector happy with our testing and that makes us happy with this purchase. Will buy more again. Opened a concession stand for an event here in town and needed these to test to sanitizer water and these worked perfectly and we passed inspection no problems! Webstaurant has the best price for these these test strips. Purchased to test our Steramine Sanitizer Tablets. It take 10 seconds dip into the solution to change color. To meet health department standard it has to be 200 ppm. The color indicator is clearly mark on the container. Will definitely reorder. Quat testing can be a pain but these strips make it quick and painless. Just dip and match up to the color on the container. No mess and no doubt that yo have the right or wrong concentration. Great test strips. Love the easy to read ranges right on the bottle. My only complaint is that the strips seem to stick together but that could just be the humidity in my kitchen. These strips are very accurate and very cheap. Great way to avoid dealing with the health inspector later down the road by getting your self tested ahead of time! The first bottle came opened and scattered, but a quick call to customer service and a replacement quickly arrived. The second shipment was protected with bubble wrap. The product meets expectations. I like that the strips come in an container, as opposed to a roll. They are easy to use and very clear. The price for 100 is very reasonable. We are loving these test strips. We bought sanitizer but had no way to really test it till now! They are very simple to use and very easy to read. Def recommend this product. I am very pleased that this product arrived sooner than expected! Excellent price for the buck and a generous amount. I will order more for those reasons.